Art Shapiro on butterflies via Annie's: https://vimeo.com/134664426. 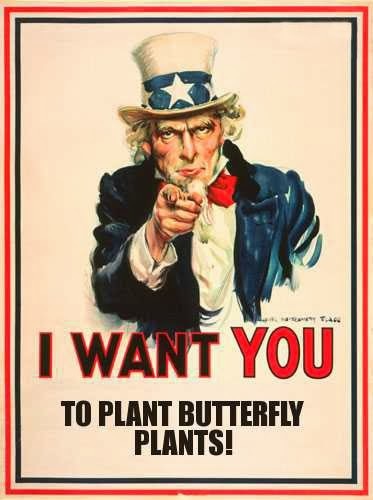 For those of you who already have a butterfly garden or are interested in possibly creating one, Art's presentation hosted at Annie's Annuals & Perennials is a must-see. All of the info in the video will pertain to our SoCal region too, as Annie's is located near Oakland, California. "Close enough for government work." as we used to say at the City. Monarch Butterfly Rest Areas Coming to Texas Highways is an article highlighting what the Texas Department of Transportation along with The Native Plant Society of Texas has up their sleeves to help with Monarch butterfly migration through their state. What a great idea! Would love to see more of this type of cooperation between government and the populace along our own transportation corridors, instead of using so much non-native species. Another added benefit besides supporting native animal populations? California natives by nature are water misers! 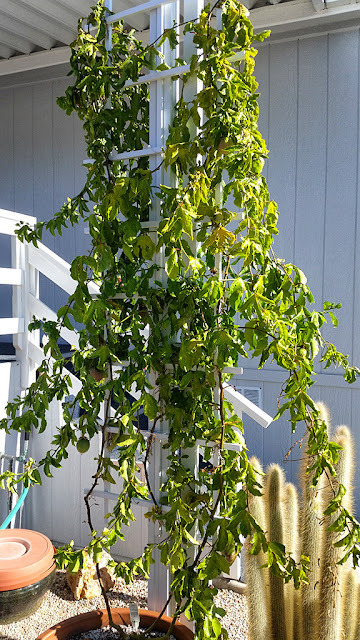 Update: As previously mentioned in the August 15th newsletter, the passion fruits on my passion vine have been ripening: they are drop dead dee-lishous! I cut them in half, scoop out the seeds and pulp, and then eat all, except for the skin. Tastes like guava on steroids. 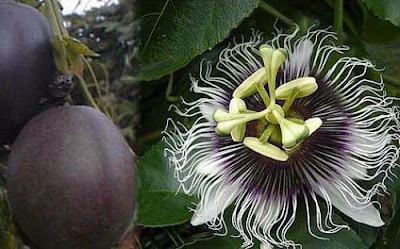 Passiflora edulis. Passion Vine, "Purple Possum"
These passion vine leaves are beginning to point towards fall around here, as they start to fade, turn yellow, and then fall. The primary reason I chose to plant passion vine, is that it's the host plant for the Gulf Fritillary butterfly. 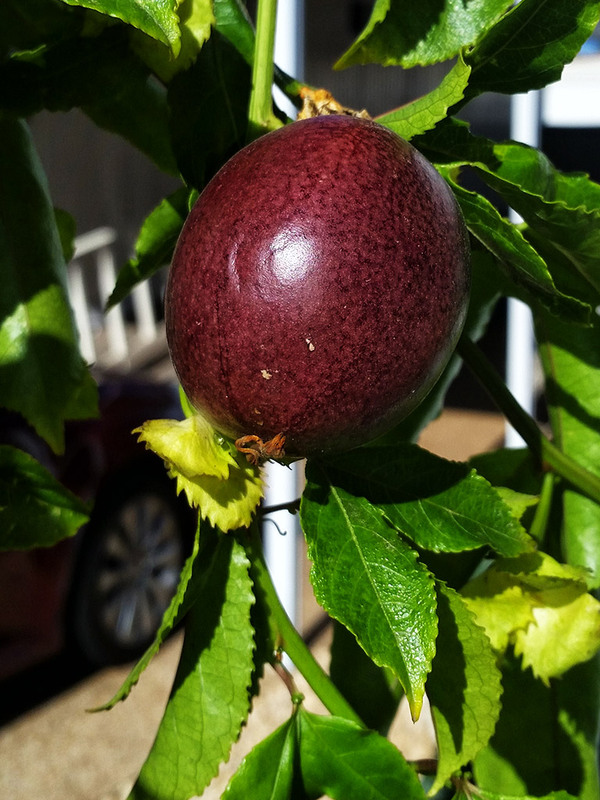 "Purple Possum" was selected for the rich quality of fruit it bears. Nature provides us with many species of passion vines, and with these, we create a myriad of hybrids and varieties. Some (I believe all) produce stunning flowers, while their fruits are "Myeh." or "Blphf!". If choosing one for your own yard, a little googling will go a long way in helping you to choose what variety is good for your wants. Beware of red-flowered species and hybrids, as they are reported to be toxic to Gulf Frit cats.